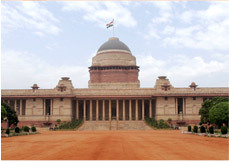 The location of 'The Retreat Building' in Shimla and the 'Rashtrapati Nilayam' in Hyderabad are indicative of the integrative role of the Office of the President of India in our country. These locations, one in north and another in south, symbolise unity of our country and unity of our diverse cultures and people. Located on the hill top of the Mashobra, the building was taken over during 1895 by the Viceroy. The President visits The Retreat at least once a year and the core office shifts to that place during stay in The Retreat. Thousand feet higher than the Shimla Ridge Top, The Retreat is located in a picturesque surrounding. The architectural pattern and the natural beauty of the place have made The Retreat a tourist attraction in Shimla. The redeeming feature of this building is that it is purely a wooden structure with dajji wall construction. Originally constructed in 1850, this building has a plinth area of 10,628 sq. ft. Located at Bolarum, Rashtrapati Nilayam building was taken over from the Nizam of Hyderabad after India attained independence and handed it over to the President's Secretariat. Constructed during 1860, this building has a total land area of 90 acres. A single storied building, it contains in its premises 11 rooms. It also has a Dining Hall, Cinema Hall, Darbar Hall, Morning room, Dining room etc. The President of India visits the Rashtrapati Nilayam and stays there at least once a year and conducts official business from this Nilayam.